Group Managing Director/CEO, United Bank for Africa Plc, Mr. Kennedy Uzoka, with the Africa’s best Digital Bank award conferred by Euromoney. Uzoka is flanked from left by Managing Director, Euromoney, Mr. John Orchard; General Manager, Energy Bank, Mr. Ebele Ogbue; and 1966 England World Cup winner, Sir Geoff Hurst; at the Euromoney Award for Excellence where UBA Group was conferred with Africa’s Best Digital Bank in London on Wednesday. Pan-African financial services group, United Bank for Africa Plc, was named Africa’s best bank in the Digital category at the prestigious Euromoney awards in London. The Euromoney awards ceremony, which was held on Wednesday, July 11, 2018 covers more than 20 global product categories, best-in-class awards and the best Banks in over 100 countries around the world, recognising institutions that have demonstrated leadership, innovation, and momentum in the markets in which they operate. In selecting its recipients, Euromoney’s principle was hinged both on quantitative and qualitative data to honour institutions that have brought the highest levels of service, innovation and expertise to their customers. 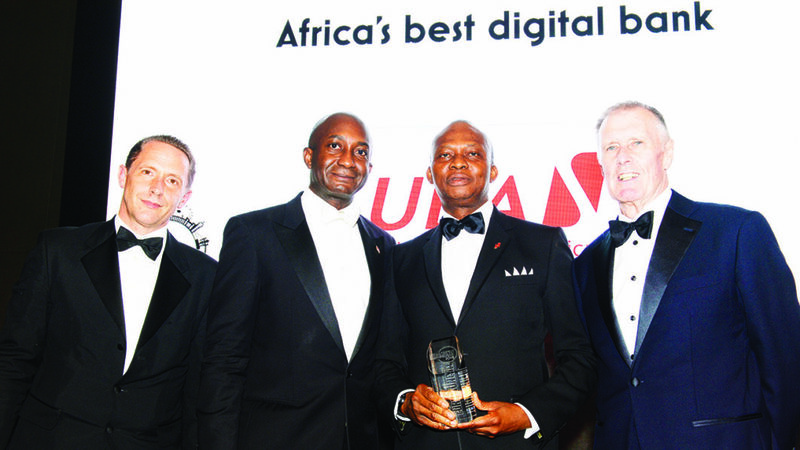 Receiving the award at a well-attended event in London, the Group Managing Director, Chief Executive Officer, United Bank for Africa, Kennedy Uzoka, appreciated the organisers for the recognition, noting that UBA’s dedication to hardwork and particular emphasis to offering quality services to customers are being acknowledged.